The word Zodiac literally means animals. It refers to the patterns and configurations of creatures as seen in the stars at night. Astrology has been used by virtually every civilization for thousands of years, and has deep roots in ancient times when less scientific methods were employed and superstition ran rampant. In many cultures, the key to who we are and what are we here for can be unlocked in the stars. Our understanding of Astrology strives toward a synthesis between science, personal experience, and religion. The most important thing about any understanding of Astrology is that it shows the connections of peoples with a clarity and irrefutability as are hardly to be exposed anywhere else. Perhaps in it alone have East and West, Christians, Muslims, Hindi and Buddhists understood one another without difficulty. 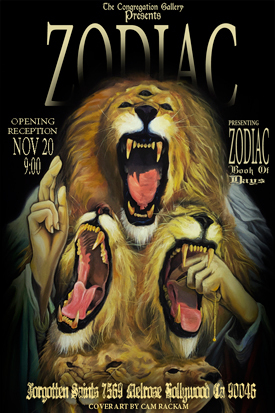 On November 24th, please observe + Z + O + D + I + A + C + Art Show with us at the Congregation Gallery.